In Alabama, a Girl Scout named Ashley has been pinned with the Bronze Cross, a Life Saving Award given on behalf of the Girl Scouts of the USA, for saving the lives of two men who were drowning in the Gulf of Mexico. 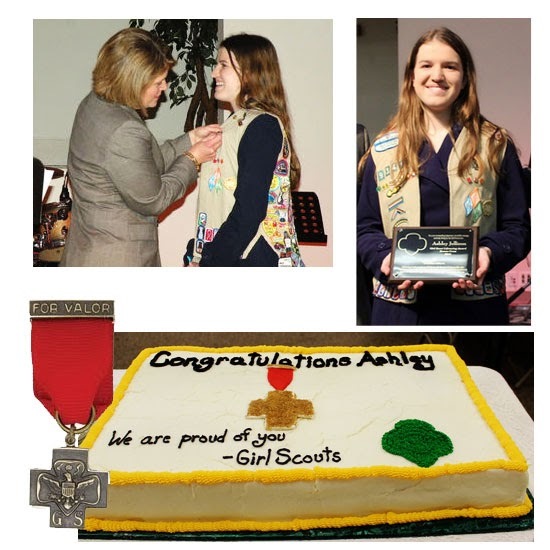 Ashley has been a Girl Scout for 11 years and earned many awards through her Scouting career, such as Junior Aide, Bronze Award, Cadette Leadership Award, Silver Award, and is currently in the process of working on her Gold Award, the highest award earned by a Girl Scout. The Life Saving Award is given to a registered Girl Scout who has saved or attempted to save human life under circumstances that indicate heroism or risk of her own life. The criteria for the Life Saving Award includes being a registered Girl Scout at the time of the rescue, and saving, or attempting to save, human life only. Only four Bronze Crosses were awarded in 2013 and two were awarded in 2014, with Ashley being one of them. 16 years old at the time, Ashley was spending time with family at Crab Island in Destin, Florida, when two men became distressed in the deep current of the water. Seeing the men didn't know how to swim well, she jumped in to their rescue, pulled them into safer water and gave them life-jackets to float on until she could swim them to safety.